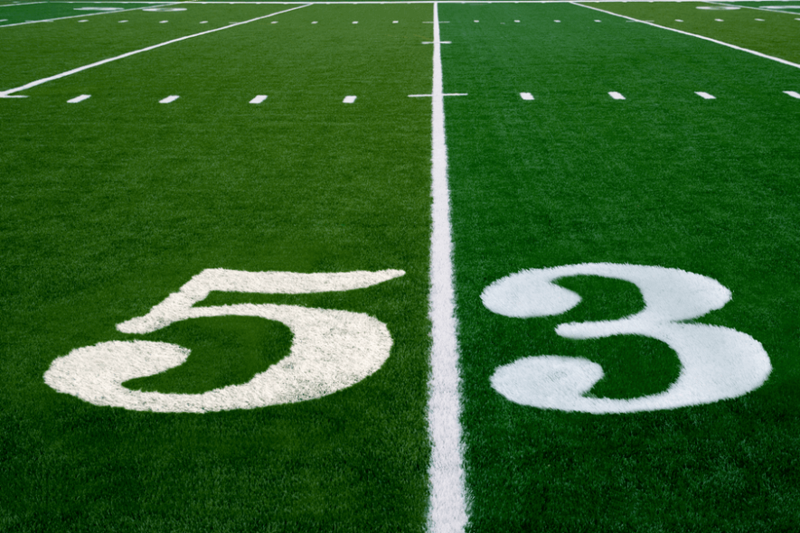 On February 3rd, people from around the world will tune in to watch the 53rd annual Super Bowl. This year it’s Atlanta, Georgia who are the hosts. The American Football Conference (AFC) champions New England Patriots will take on the National Football Conference (NFC) champions Los Angeles Rams. Fans say that this has been the most entertaining season in recent years. The Rams hope to lift the Vince Lombardi trophy for the first time since they moved from St. Louis to Los Angeles. The Patriots will compete in the Super Bowl for the record 11th time looking for their 6th Championship title. The National Football League (NFL) board chose the venue for the 53rd Super Bowl back in 2015. There were four finalists; the Hard Rock Stadium in Miami, the Raymond James Stadium in Tampa and the Mercedes-Benz Superdome in New Orleans. After they tallied the final votes, the board chose Atlanta to host the Super Bowl this year. Miami will host the LIV Super Bowl and Tampa the LV edition. Altogether, this will be the third time Atlanta hosted the Super Bowl, but the first time in the Mercedes-Benz Stadium. They opened this amazing venue in September 2017. It has a retractable roof and it cost around $1.6 billion to build. The Stadium is the fifth-biggest covered stadium in terms of capacity. It can welcome 71,000 fans at any point. The venue is the official home for the NFL team Atlanta Falcons and the Major League Soccer (MLS) team Atlanta United FC. The fans will enjoy the World’s largest video display which takes up 63,000 square feet. In addition, there are over 2,500 TVs around the stadium. Seven-time Grammy winner and the Empress of Soul, Gladys Knight will sing the National Anthem before kick-off. She’s had six number one albums and eleven number one singles. Together with the Pips, the industry inducted her into the Rock and Roll Hall of fame a few years ago. One of her more famous singles is the theme song for the 1989 James Bond film Licence to Kill. The Rolling Stone magazine has listed her as one of the 100 greatest singers of all time. As a Georgia native, she will surely energize the crowd at the Mercedes-Benz Stadium. Artists like Pink, Lady Gaga, Luke Bryan and Idina Menzel performed the anthem in the past. Whitney Houston in 1991, Beyonce in 2004 and Jennifer Hudson in 2009 were probably three of the best performances of the National Anthem. The half-time show has become one of the main features of the Super Bowl game. Previously, many different superstars have graced the stage for the half-time shows. These include some controversial performances, like the Janet Jackson and Justin Timberlake controversial showing in 2004. Bands and artists to headline at the Super Bowl were The Rolling Stones, Gloria Estefan, Phil Collins, U2, Shania Twain, The Who, Madonna, Katy Perry, the Black-Eyed Peas, Usher and many others. This time around, pop band Maroon 5 will be the main music attraction at the Pepsi Super Bowl Halftime Show. Travis Scott and Big Boi from the band Outcast will join them on the stage. Before the big game, organizers have scheduled several other interesting and entertaining events in Atlanta. Some will happen on the day of the event while others will take place in the days leading up to the Super Bowl. The State Farm Arena, home of the NBA team Atlanta Hawks, will host a three-day concert for the first time. Megastars like Aerosmith, Ludacris, Migos, Bruno Mars and Cardi B will entertain the fans. On the day of the Super Bowl, downtown Atlanta will host various entertaining events. Hopefully, these will all help to enhance the whole Super Bowl experience. For the third year running, the cost of advertising during the game has stayed the same. Companies have made 30-second long commercials which cost them $5 million each. News outlets have reported that Anheuser-Busch LLC has made their largest ever ad purchase for the Super Bowl. They paid for eight different commercials lasting five and a half minutes. Ads will advertise seven different products, three of which we’ll see for the first time during the game. The Super Bowl is one big money-making machine. Ticket prices were anything from $950 dollars up to $5,000. Outside of the official ticket sellers, tickets will sell for around $7,300 on average. The biggest expense on Super Bowl Sunday is beer. In 2017, fans across the US spent $1.3 billion on beer. Betting fans around the world wagered over $4.75 billion on the game last year, most of it illegally. Apart from the fans at the Stadium, more than a 100 million TV viewers around the world will tune in for the game. This is the reason companies will pay so much for airing their ads during the Super Bowl. In 2017, various brands spent nearly $400 million on ads during the game. Many game experts think it was the game against the then St Louis Rams 17 years ago that propelled Tom Brady into one of the all-time greats. Can this young Los Angeles Rams team mark the end of GOAT’s career and make room for Jared Goff and the crew? At the end of the regular season, pundits have highlighted the LA Rams as the most innovative NFL team. The new way that Sean McVay is looking at football and managing players has paid off so far. Last year they were awful at the start of the season, yet they recovered to finish 11-5. The Rams finished this season as the number 2 seed in the NFC, with a score of 13-3. They ended up sharing the best record in the NFC with the New Orleans Saints. The LA offence was second best in the NFL in points scored and yards gained. Running back Todd Gurley led the field with 17 rushing touchdowns. The LA defence was also impressive, with Aaron Donald one of the best defensive tackles in the NFL with 20.5 sacks (first in the league). Sean McVay is the youngest head coach in NFL history, only 33 years old. Jared Goff is playing in only his third season at 24 years of age. He achieved new career highs this season, finishing fourth in the league with 4,688 passing yards, 32 passing touchdowns, 108 rushing yards and two rushing touchdowns. His overall passer rating was 101.1. The Rams are altogether a high scoring team with 32.9 points per game on average. They ended the regular season second behind the Kansas City Chiefs. What’s there left to say about the New England Patriots? In 2002, New England defeated the St Louis Rams in the XXXVI Super Bowl. Since then, the Patriots have played in the big game a record 10 times. This will be their 11th Super Bowl in 18 years. So far, they have won five and lost five. Tom Brady has appeared in a record nine Super Bowls. Coach Bill Belichick is preparing for his record 12th Super Bowl. In nine of those, he appeared as head coach for the Patriots. The Pats finished the season as the number 2 seed team in the AFC, behind the Kansas City Chiefs. Their score at the end of the regular season was 11-5. This meant that they have recorded double-digit wins in a season for the 17th straight year. The LIII Super Bowl will be their third straight, equalling Miami Dolphins and Buffalo Bills in that respect. New England finished the season as the fourth best offensive team. Tom Brady once again managed over 4,000 passing yards and 29 touchdown passes. This means he is now only the second quarterback in NFL history to make 70,000 passing yards. One reason that the Patriots were successful in the playoffs this year was Brady’s protection. Neither the Los Angeles Chargers nor the Kansas City Chiefs could sack Tom Brady. They will have to work to repeat that coming up against Aaron Donald, the Pro Bowl defensive tackle who made over 20 sacks this year. Pittsburgh Steelers hold the record in the number of Super Bowls trophies. They have won it six times, the last time in 2009. The New England Patriots have dominated the Super Bowl the last 20 years. They played in the ultimate game ten times winning five Vince Lombardi trophies. Out of the last four Super Bowls, they contested three and won two, in 2015 and 2017. Out of the other teams, only the Baltimore Ravens and the above-mentioned Steelers have won it more than once. The Ravens were successful in 2001 and 2013 while the Steelers were champions in 2006 and 2009. Los Angeles Rams won it in 2000, back when they were still based in St Louis. How to bet on the 2019 Super Bowl? Point spread – You can bet on either the Patriots or the Rams. Betting on a spread is betting on by how much your team will win or lose by. If you guess right, you win. Over/under – You try to guess how many total points will both teams score. If the site offers an over/under of 50, you can go over 50 or under 50. You win if you guess correctly. Moneyline – You bet on the outright winner or loser, favourite or underdog. Normally you can win more by betting on the underdog. 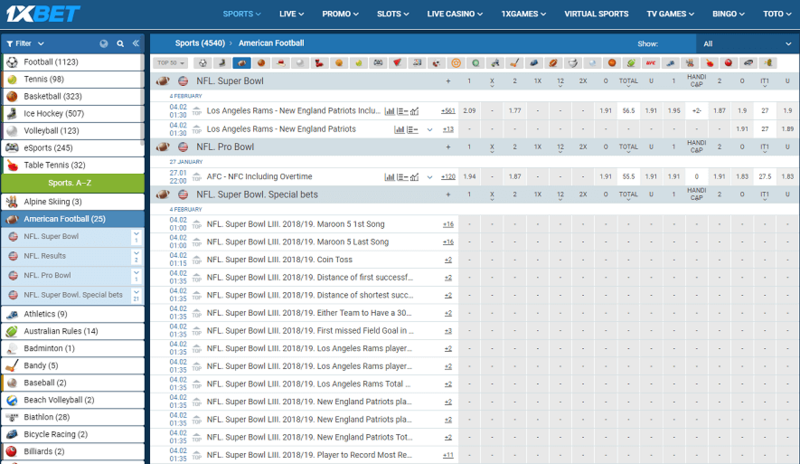 Live betting – Some online betting sites might offer live gambling on the Super Bowl where you can place wagers during the match, until the end of the game. 1×2 bets – Three-way betting where you can bet on a home win, draw or away win. Here, the Los Angeles Rams will be the home side. NFC and AFC teams alternate as home sides each year. Halftime points by either team. The first player to score a touchdown. The total number of yards for the half/whole game. The number of touchdowns per quarter. Passing yards per half or per quarter. The number of penalties for each team. How long will it take for Gladys Knight to sing the national anthem (Over/Under)? Coin toss – Will it be heads or tails? Which song will Maroon 5 perform first at the half-time show? Will either of the quarterbacks throw over 400 yards during the game? Which records will these teams break? How many tweets will Donald Trump send during the game? Will the retractable roof at the stadium be open or closed for kick-off? What colour Gatorade will the players pour on the winning coach? Many betting sites will let you choose what you want to bet on but be sure to check before the event. 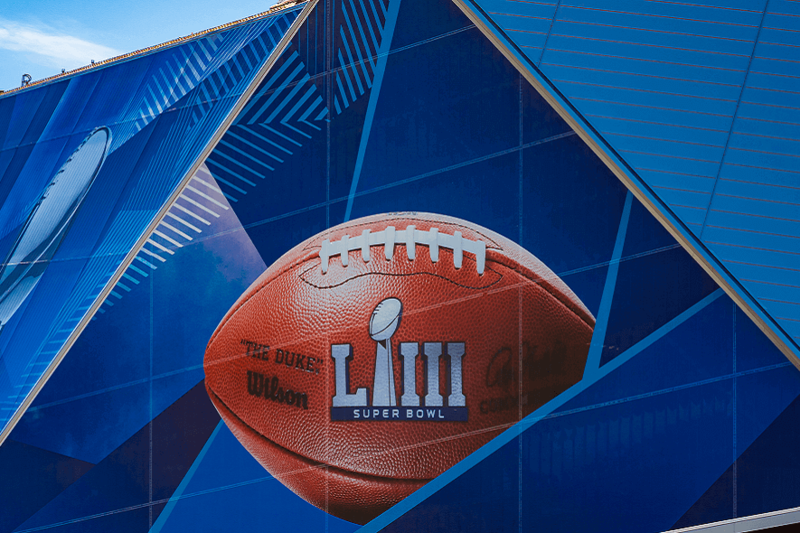 Where to bet – 2019 Super Bowl betting odds? We have looked at most of the online betting sites available in Nigeria to give you a list of sites where you can bet on the Super Bowl. It’s important to note that you must be 18 years of age and a Nigerian resident to register on any of the sites we will list. 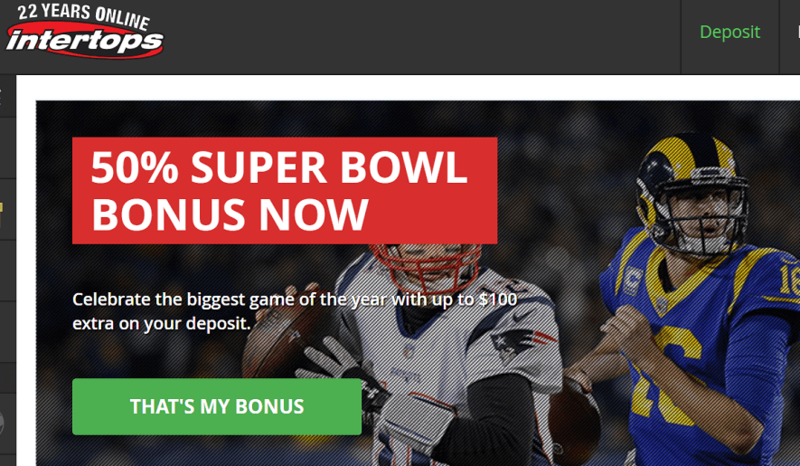 The 1XBET online betting site has a comprehensive offer of markets for the Super Bowl. The odds for New England Patriots to win are 2.09 while the odds for the LA Rams to win are 1.77. The over/under odds for 58 points total are 2.02 for over 58 and 1.7 for under 58. The odds for the first points of the game to be through a touchdown are 1.525 and 2.65 in case of a field goal or safety. If you think the Patriots will win by 6 points or more, 1XBET gives you odds of 2.3. There are special bets like a coin toss bet, 1.91 odds for Heads and 2.0 odds for tails. Odds on Maroon five performing “What lovers do” as their opening song are 2.5. If you like “Moves like Jagger” for the first song, then the odds are at 4. The 1XBET people favour the Patriots to enter the red zone first at 1.8 odds, while the Rams stand at 1.91. Super Bowl spreads – Patriots with a point spread of -2.5 at -110 and a Moneyline at -135; Rams with a point spread of +2.5 at -110 with the moneyline at +115; Over/under a total of 57 points, both teams at -110. 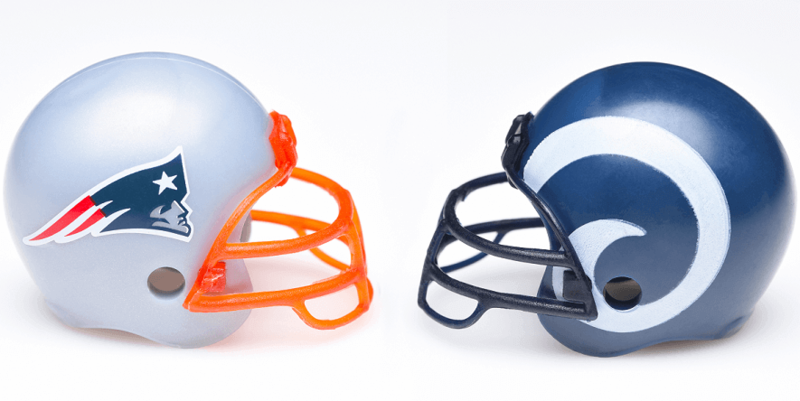 Various prop bets – First score, exact score betting, total touchdowns in a game, first successful field goal yardage etc. Touchdown scorers – Both Todd Gurley and Sony Michel are at +600 and favourites to score the first TD. 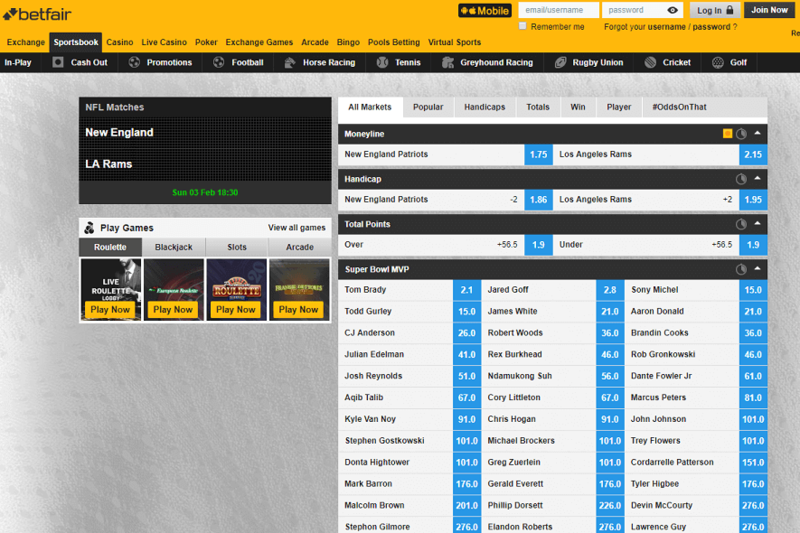 The Betfair online betting site is also offering great markets for the Super Bowl including the regular bets where they have Patriots as the favourite for a 2-point spread at 1.86, with the Rams at 1.95 and equal odds on an over/under of 56.5 points at 1.9. They offer 1.9 odds on Jared Goff passing over 281.5 yards and 1.8 odds on under 281.5 yards. Odds on Tom Brady passing over 1.5 touchdowns are at 1.83 while the odds of him passing less than 1.5 TD are at 2.37. Other than these, there are special prop bets like 3.75 odds on both Brady and Goff passing over 300 yards. The folks at Surebet247 have tried to offer you a lot of options for Super Bowl bets. They also favour the New England Patriots to win outright with odds at 1.71, while giving the Los Angeles Rams odds of 2.15 for a win. The over/under for a 57 points total is equal at 1.92 odds. At Surebet247, they favour Sony Michel to score the first touchdown with the odds of 6.75 while Todd Gurley is close behind at 8.0 odds. The New England Patriots have Bill Belichick and Tom Brady, both regarded as Greatest of all Time. Most will think that that’s enough. The comeback in the 51st Super Bowl from 28-3 down against the Atlanta Falcons shows their greatness. In that game, they recovered to win 34-28. And again, last year, they were 22:12 down at halftime, but this time they were powerless against the Philadelphia Eagles who won 41-33. The Rams showed their potential in the divisional round against the Cowboys, beating them 30-22. And they showed character after going 13-0 down against the favoured New Orleans Saints in the NFC Championship game. The Rams recovered to finish the half time down by only three points. They kept their nerves with the game going into overtime to win 26-23 and book a ticket for the Super Bowl. The main weapon for the Rams is their offence. The Patriots will have to work hard to rush Jared Goff at every opportunity as he has shown nerves when under pressure. Question is whether they will do it. The Rams improved their defence greatly this year. Brady will face blitzes from the Rams defensive line and especially from Aaron Donald. The Rams have scored on average 32.9 points per game during the regular season, while the Patriots have managed 27.2 per game. Rams have allowed on average 24 points per game, while the Patriots have allowed other teams only 20.3 points per game. The X-factor in this match might be Todd Gurley who’s been quiet in the last few games. Some have even suspected an injury. The team has denied all the rumours. It might have been their tactic to conserve him in the playoff games. Tradition and the always rising form of the Patriots suggest that they are the favourites, but you shouldn’t discard the Rams. For sure, they have nothing to lose and will come out guns blazing. LionsBet online betting site gives you an opportunity to win a free bet if you stake a minimum of 20,000 Naira on various bets for one week. If you do, you will receive a free bet of 500 Naira you can use to wager on any single match. Win a free bet from Surebet247 when you actively get involved on their social media. More information is available on Facebook, Twitter and Instagram – to find their pages, just search for Surebet247. Columbia Broadcasting System (CBS) will take their turn broadcasting the 2019 Super Bowl, for the 20th time since 1967. As with the last Super Bowl they covered (Super Bowl 50), they will use 115 cameras including something called “Augmented reality”. CBS will broadcast the game live on TV and stream it on the internet via the CBS All-Access Pass. Internationally, most European countries will pick up the live coverage of the game. It’s best to check with your local cable provider who will show the event live. Anyone who has purchased the NFL Game Pass at the start or during the season can stream the game live. For the first time, CBS will use 8K resolution (Full Ultra HD) cameras in both end zones. Tom Brady, at 41 years of age will play against the 24-year-old Jared Goff. That sets the record age difference between two opposing QB’s in a Super Bowl. The 66-year-old Patriots head coach Bill Belichick will try to use his experience to out-manoeuvre the 33-year-old Rams head coach Sean McVay. This also sets the record age difference between two head coaches in a Super Bowl. Since 1969, this will be only the second time that the two different cities’ NFL and MLB teams have battled for the title in the same calendar year. The Boston Red Sox defeated the Los Angeles Dodgers in the 2018 World Series. Tom Brady in his own right has played in more Super Bowls (nine in total) than any team in the NFL. The closest are the Pittsburgh Steelers, Denver Broncos and Dallas Cowboys who have contested eight Super Bowls each as a team. Back in 1967, when the first Super Bowl was played, a 30-second ad cost $40,000 compared to this year when you must pay $5 million. The ticket prices in 1967 were on average $6, while now they are over $1,000. To be safe, make sure you use only verified betting sites which have a good reputation. Most of the biggest online betting sites use servers in Europe where the security measures are the best. If you are not sure about a site, have a look at their customer service record and ask around. The good sites will use SSL encryption to keep your personal details secure. Make sure the online betting site is registered to operate in Nigeria and that they have a valid licence. Read about where they are based and how long they exist. Always check that the betting site accepts players from Nigeria and what the payout terms and conditions are. You can find a lot of information about betting sites on online betting discussion boards. If in doubt, walk into one of the retail betting shops in your town and place a bet in person. How much money I can win? While nobody can guarantee you a win, if you search around for the best odds and wisely stake your money, you can win a lot. Before you place any bets, make sure you do a lot of research. Look into trends, statistics, current form and even local factors like the weather or stadium location. Lets say a team normally plays in an open field, and now their schedule takes them to a stadium with a retractable roof. Have a look at their record in stadiums with closed roofs. Make sure you are up to date with the roster and any changes, like last-minute injuries. Look for special offers and bonuses. Some sites run monthly promotions where they give you bonuses on every deposit you make on a bet. Why are odds different at different sites? Odds are different at different sites because of varying opinions of people creating the odds. They won’t all agree about the predicted results and scores. It also depends on the amount of research and sometimes computer algorithms.